Locke and I wrote this during our time at Kitsune Kon. We talk about it for a bit in our Writing Humor for Comics panel. 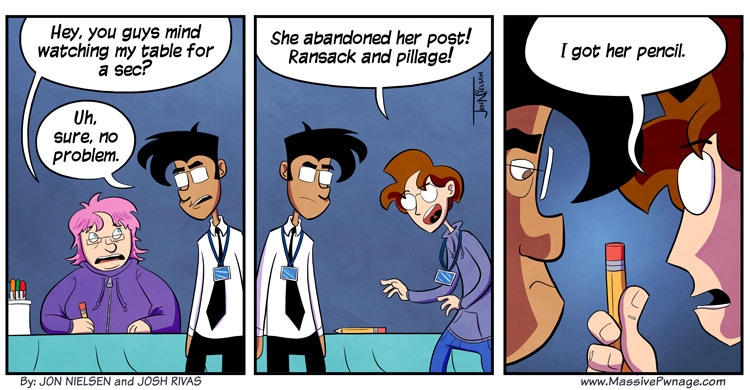 This entry was posted on Wednesday, April 4th, 2012 at 12:00 am and is filed under Comics. You can follow any responses to this entry through the RSS 2.0 feed. Both comments and pings are currently closed. it may not look like that but its worth 200 septims at least! Kitsune Kon was awesome! Thanks for coming! After seeing you guys there, I started reading this webcomic.